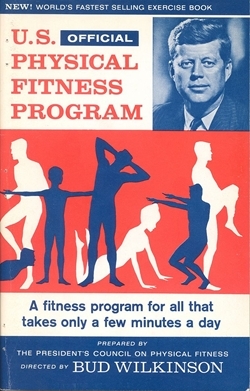 No thanks to John F. Kennedy’s attempt to improve the fitness of millions of children, the “Go you Chicken Fat Go” song was ingrained in the memories of tens of thousands of kids, including myself. Those of you also suffering from post traumatic PE stress disorder remember being humiliated performing calisthenics to this song in the late 1960s and early 1970s. In my case, it was performing this very outdated song while wearing the one piece gym suit uniform that we were required to wear in junior high. 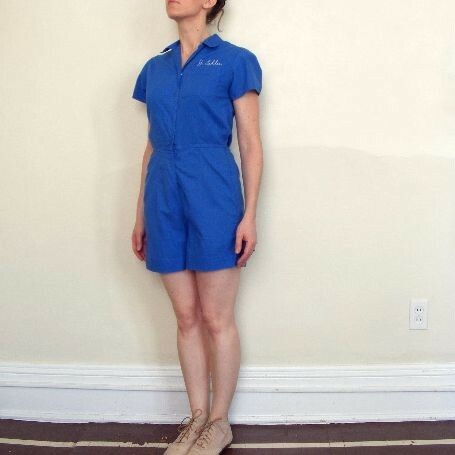 Our “monkey suits,” as we called them, were bright royal blue in color and hit most of us about knee length. Luckily, our suits had snaps which made getting those horrible things off quickly after class a breeze. Miss Blank (afraid to use her real name) was the stereotypical sadistic PE teacher from my junior high and high school years. Butch haircut, un-stylish polyester men’s coach shorts, jangly janitor keys dangling at her waist, and a whistle around her neck, her fast walking cadence was a dead give-a-way to her terrifying proximity. She was the worst enemy of uncoordinated, clumsy kids who would freeze when they heard her coming down the hall. We would all stand at attention as she entered the room to put the “Chicken Fat” record on the record player for our six minutes of hell. The “Chicken Fat” calisthenics drill was nonstop arm-swinging, push-ups, marching in place, jumping jacks, and lying on the floor with your legs up pretending to pedal a bicycle really fast. If an alien had happened upon this scene it would never have wanted anything to do with our strange planet. Another great blog! I could barely stand listening to that song for 2:39 let alone 6 minutes! I can’t believe you had to do that… but maybe it worked because you are chicken fat free. Thanks for sharing, it definitely brought back memories of junior high PE… bad and good. Can’t believe you were forced to listen to it also! You are so young, that song was way old when you were in school. Looks like rural eastern Oregon and small town Montana were both behind the times. Bob, Rob and Sharon had never heard of it and thought that I was crazy when I told them about it. I love your blogs but this one is the funniest ever. It was like we were on a weird trip back then. Miss Blank hated both of us because we were good athletes. I remember when she tried to tell me I was doing the Breast Stroke wrong. Why did I win so many swim meets and not get DQ’ed? I was amazed though how many of my friends in my age group did not have to listen to that song The one piece monkey shorts were the worse. I remember having to perform a dance at a 1-2 time show wearing them.We wanted to die.